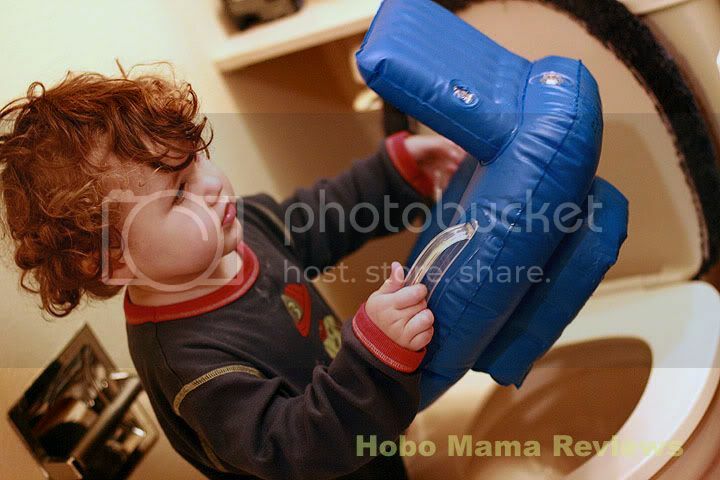 Hobo Mama: Giveaway of an inflatable potty seat at Hobo Mama Reviews! Giveaway of an inflatable potty seat at Hobo Mama Reviews! We're gonna need more paper. I am hosting my first honest-to-goodness review and giveaway from a real, live company (after my previous giveaway of a handmade treasure) over at Hobo Mama Reviews — the On-the-Go Inflatable Potty Seat. I am so excited to bring you a pottying tool that will be useful for the potty-learning toddlers out there as well as those parents doing elimination communication with their babies. Click over to Hobo Mama Reviews to read the full review and enter the contest for one of FIVE inflatable potty seats being given away! I talk about the seat's features and show some delightful pictures of pottying in action, which is incentive enough, really. Below is a little background on how I came to be doing a giveaway for On-the-Go Potty Seats, in case you're wondering what my connection is. I've told you a little bit of our elimination communication (EC) journey with Mikko. We did part-time EC with cloth diapers for backup. Just before two years old, we said sayonara to the cloth diaper service and went with pottying full time. One of the challenges, though, of either (a) pottying (not potting) a young and therefore small baby or (b) taking a potty-learning toddler out and about is finding appropriate and appropriately sized places to potty. Mikko is 2.5 years old, and even though he's very large for his age, adult toilets are still too cavernous for him to sit on. If we're at home, he'd rather use any of the following methods: (1) BabyBjörn Little Potty , (2) BabyBjörn Potty Chair , (3) a seat reducer for the adult toilet, or (4) standing up in the bathtub (hey, whatever works!). Now, of these four methods, really only #1 and #3 are transportable. That is, only bringing a small potty with us or a seat reducer will work for when we're out in public and needs must be taken care of. The problem with a potty is that, even if we bring a BBLP (emphasis on little), it's still plenty bulky. We have a travel, fold-up potty and seat-reducer (the Potette Plus ), but problems with it are that it requires a waterproof bag and absorbent material (they sell disposable liner kits — some people use diapers or washcloths with a plastic grocery bag instead) to use it as a potty, we haven't had much luck getting Mikko to use it as a seat reducer, and it's still rather bulky and hard plastic. You can't, for instance, toss it in an average purse — you have to have a bag large enough to tuck it in, and then not mind if the knobbiness digs into you as you walk. What does all of this have to do with the On-the-Go Inflatable Potty Seat? I first came across this product on Twitter. I don't even remember how. Maybe from Lisa's guest post on elimination communication or my post on EC techniques used with potty learning for toddlers that got Tweeted and picked up; maybe I was searching related potty-training hashtags. Whatever the source, I was intrigued. It's a blow-up toilet seat reducer. You manually (orally? mouthily?) inflate it, and then it fits snugly inside any adult-size toilet, whether public or private. There's a quick-release valve on the back for instant deflating, so that you can roll it up, tuck it into your bag, and go about your business, your child's business having been done (get it? "business"? potty humor). I Tweeted a question: But what if your mouth touches where a public toilet has been? And the president, Michael McGuire, wrote back to assure me that the inflater valve is many inches away from any toilet-seat contact. Phew! In a spirit of temerity, I wrote Mike directly and said: Hey, how about a giveaway? I asked for one to review and one to give away, but he's offering FIVE to give away. Yes, five readers get to win an On-the-Go Inflatable Potty Seat! Perfect for ECing infants and potty-training toddlers! The contest ends Feb. 11. 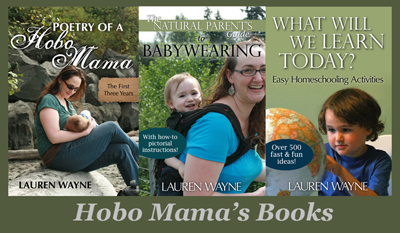 So, head on over to Hobo Mama Reviews to enter to WIN! The photos on your review site of Mikko are priceless! Oh! He is too cute. Definitely I want a front shield for my boy's inflatable potty.